South Korea has declared an effective end to the threat from the MERS outbreak, which killed 36 people and hurt Seoul's already slowing economy. Since being discovered in May, the outbreak of the Middle East Respiratory Syndrome infected 186 people and forced more than 16,000 others into quarantine. No new cases have been reported for the past 23 days, according to Prime Minister Hwang Kyo-ahn, who spoke following a government meeting Tuesday. "The last suspected patient was released from quarantine yesterday. It is the assessment of the government and the medical community that the public can rest easy," he said. The outbreak rattled the country, prompting thousands of schools to shut down and keeping many at home in fear of becoming infected. There is no vaccine or cure for the disease, which was brought to South Korea by a 68-year-old businessman who had traveled to Saudi Arabia and surrounding countries. MERS, a coronavirus, is related to the one that infected thousands during the 2003 outbreak of Severe Acute Respiratory Syndrome, or SARS. MERS was first reported in Saudi Arabia in 2012 and has spread to several other countries. The disease usually spreads poorly, but experts suspect South Korea's crowded emergency rooms and hospital wards might have contributed to a wider-than-expected transmission. South Koreans' habits of “doctor shopping” - visiting multiple facilities to treat the same illness - and having many friends and relatives visit hospitalized patients also might have contributed. 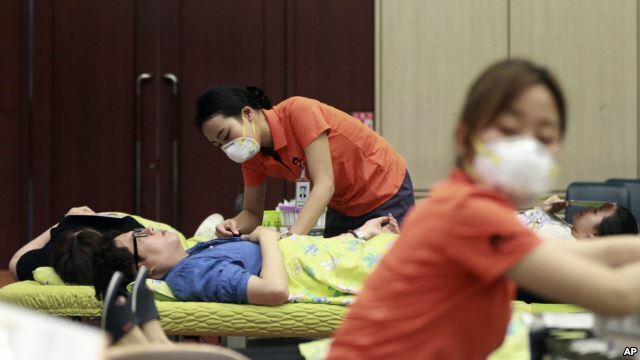 The public alarm over MERS rattled South Korea's economy, which posted its slowest quarterly growth in more than two years in the three months through June. The Bank of Korea partially blamed the slowed growth on sapped consumption as foreign tourists cancelled visits and people stayed home in fear of infection. Authorities in seven countries, including several regions in China, Czech Republic and United Arab Emirates, had advised their citizens against traveling to South Korea over the MERS outbreak, and Vietnam on Tuesday became the last country among them to lift the travel warning, according to Seoul's foreign ministry. Hong Kong is maintaining an alert against non-essential travel to South Korea, but the foreign ministry said it was expecting it to be lifted.